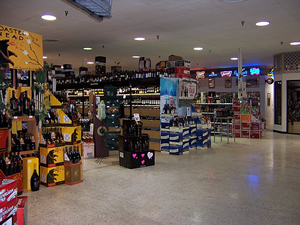 Total Discount Liquors has been serving the Carroll County community since 1988, bringing you the finest of wines, spirits and beers at discounted prices. We are a local family owned business. In 2000, we expanded to a new location. Our store is now a whopping 10,000 square feet, the largest liquor store allowed by Maryland state law. We offer you the largest selections and many hard to find products! In addition to our everyday discounted prices, we also have spectacular monthly specials so visit us often and experience a huge selection with small store attention. If you have any questions, please do not hesitate to ask one of our highly knowledgeable staff members. We can help you with everything from what to serve with dinner, to helping you throw that phenomenal party or reception. We are open 7 days a week, so come on into Total Discount Liquors and see what everyone is talking about!